Automatically send out a personalized Thank You message AND add your customers to any follow-up autoresponder! Unauthorized visitors will be redirected to a WARNING ERROR page if they try to access your download page without paying first. What are the three biggest hassles you face when it comes to selling your products using ClickBank? Now, with ClickBankPRO, You can Eliminate all these Hassles - and More! Our easy-to-install Clickbank Thank-You Script will protect your download pages. It will also send both a Thank You message and follow-up messages to your customers. Now you can REALLY put your business on Auto-Pilot! The system will verify whether your buyer is forwarded from ClickBank after payment. If not, he/she will be denied access. The System will collect both the name and email address of your buyer. Unlimited usage. 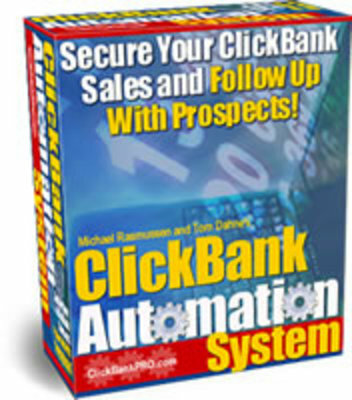 You can use this script to monitor and automate sales for ALL your ClickBank products. Not browser dependent - works with all versions of Internet Explorer, Netscape, Opera or any other browser. Easy to setup and install. You dont need any programming expertise. Just make a few small edits as explained in the simple instructions. You can be automated within the hour! You dont have to manually prepare and send a thank you message to every buyer - its sent automatically for you. You dont have to add customers to your autoresponder sequence - its done for you. You dont have to worry about thieves stealing your downloadable products from your Thank You pages. ClickBankPRO will stop them in their tracks! You dont have to send out follow-up emails manually. Just set them up once on your autoresponder and theyll be sent out automatically to every customer. By including a list of common problems and solutions with your first Thank You message, you help reduce the risk of refunds/chargebacks as well as increasing customer satisfaction. You can go away on vacation safe in the knowledge that your business is continuing to work for you. Youll be sending out personalized Thank You messages AND promotional emails - even while you relax on the beach! But thats not ALL you get with ClickBankPRO! ClickBank PRO PackageThe Thank-You script is just half of the ClickBankPRO package. Its the half that SAVES you time and money. Put a Personalized ClickBank Search Box on Your Website! The Clickbank MarketPlace features over 5000 top-rated ClickBank merchant websites that are offering sales commissions that go as high as 75. Now you can tap into that earnings potential with our very powerful Clickbank Search Script. With this easy-to-install script you can earn extra ClickBank affiliate commissions with ease. Just setup the script, put the search box on your web page(s) and, hey presto, youre ready to go! Every time your visitors run a search, your ClickBank Nickname will be integrated into the search results. When your visitors click on any search results and place orders, youll earn commissions for each sale. Easy to set up and install. Full instructions are included. Comes with a built-in ClickBank Database Update Builder so your visitors will always get the latest results available in the ClickBank MarketPlace. Easy to customize to match the look and feel of your website. Can be added to an unlimited number of websites. You could make an unlimited number of targeted niche websites. Its never been easier to set up your own money-making search engine! An hour from now, your visitors can be able to search the whole Clickbank MarketPlace directly from your website. And you can profit from their searches! The two scripts in the ClickBankPRO are both worth a lot of money on their own. You only have to look at the prices being charged on other websites selling equivalent products to see just how much these scripts are worth. And those other sites charge those prices for just one of these scripts. With the ClickBankPRO Package, you can own both for one low price! And that includes MASTER RESALE RIGHTS! Remember, youll own full 100 Master Resale Rights to the ClickBankPRO Package!